Old vehicles are the perfect thing to recycle during the holiday months. Not only do you get an excellent tax deduction for the same tax year if you make your online donation before 12 A.M. local time on January 1st, but you are helping a local child receive a magical wish experience, and you are putting your old car to good use. However, old vehicles are not the only thing to recycle before the New Year. You most likely have plenty of holiday decorations to recycle too! When the holidays are over, you may have a big mess of decorations all over the place. How do you get rid of your holiday tree, holiday lights, cardboard boxes, gift boxes, wrapping paper, gift bags, ornaments, greeting cards, or toys? Don’t just throw them away! If you won’t reuse them, then recycle them! Instead of throwing away your old holiday decorations, consider using them for as long as you possibly can. Why fix what isn’t broken? Use lights until they don’t work anymore, and then visit http://www.holidayleds.com/ to recycle them via mail when you can no longer use them. As for greeting cards, try to get creative with them. Put them in a scrapbook or completely reconstruct them and attempt to use them again for your cards the following year. Use them as gift tags for the following year. Reuse your cardboard boxes throughout the year for other various gifts, or stash them away with your other holiday items so you can reuse them the following year. If you have any extra items that you don’t want, consider donating them to charity. Ornaments, toys, wrapping paper, and any other holiday gifts or supplies are always in demand. If you don’t want something, there’s a good chance that somebody else will! That holiday tree of yours can be recycled! Your tree can be used as compost or mulch and many communities have tree-cycling drop-off sites so tree-cycling is easy and convenient. When you recycle your holiday tree, rather than throwing it away at the end of the season, you are extending your tree’s usability and are transforming it into something bigger and better. At Wheels For Wishes, we are all about recycling and making the most out of each and every item. Like car donation, tree-cycling can transform into something amazing and its possibilities are endless! When trees are tree-cycled, they are usually used for mulch, erosion protection, habitat creation, and shoreline stabilization. However, communities are always finding new ways to use tree-cycling, so tree-cycling is very important and really does make a difference. A tree can do so much more than just serve as a decoration during the holidays and end up in the garbage afterward. Tree-cycling is the way to a greener world! To find a location to recycle your holiday tree, please visit http://search.earth911.com/?what=Christmas+trees and just type in your zip code. If cardboard is clean and dry, it is recyclable! If you can’t reuse it in any way (for shipping, gifting, a pet toy, storage, etc.) then recycle it by putting it in your recycling bin. Paperboard also has many different usages. Paperboard can be identified as a cereal box or a gift box, and if it cannot be used by you, then it can easily be recycled and is accepted by most curbside programs. Like most mail, greeting cards can be recycled with your other mixed paper. Since there are about 2.65 billion Holiday cards send out each year, reuse and recycling are very important. Try to reuse other greeting cards in creative ways, or simply recycle them instead of throwing them away. Create a photo album or scrapbook specifically for photo greeting cards and place them in there. Electronic cards are eco-friendly and easy to send out, so sending out as many e-cards as possible is another great way to go green! Don’t forget to recycle any holiday catalogs you receive. If you’re no longer interested in receiving the catalogs, make sure you have yourself removed from their mailing list. Or just subscribe to receive the electronic copy. Reusing ribbon is extremely important. Just think about how little ribbon actually does, besides made a gift look pretty. Is there a need to throw it away after just one usage? Use ribbon as many times as you can, and remind others to do the same! Volunteer to be on the holiday clean-up crew so you can set ribbon aside. Same goes for tissue paper. Plus, you’ll save money and won’t have to buy more supplies next year! 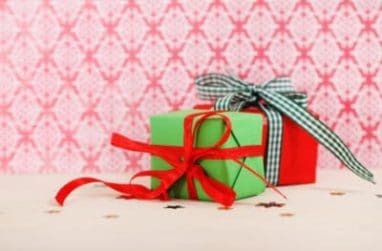 Wrapping paper can be a bit tougher to reuse, but try to reuse as much of it as possible, and recycle when you’re done with it. If you can’t reuse what you have, look for paper containing reusable content, or get creative with what you wrap your gifts in. Wrap gifts in items that have multiple usages, such as a scarf, basket, decorated paper bag, or old calendars. Or put gift items in a reusable shopping bag, which will help eliminate single-use bags! This holiday season, you have so many options for going green and giving back to the community you live in. Whether you donate a car to Wheels For Wishes, or reuse and recycle all of your holiday items, you will be helping to make the world a better place. For more information on donating a vehicle to Wheels For Wishes, read our 2012 Donate Car To Charity Guide.